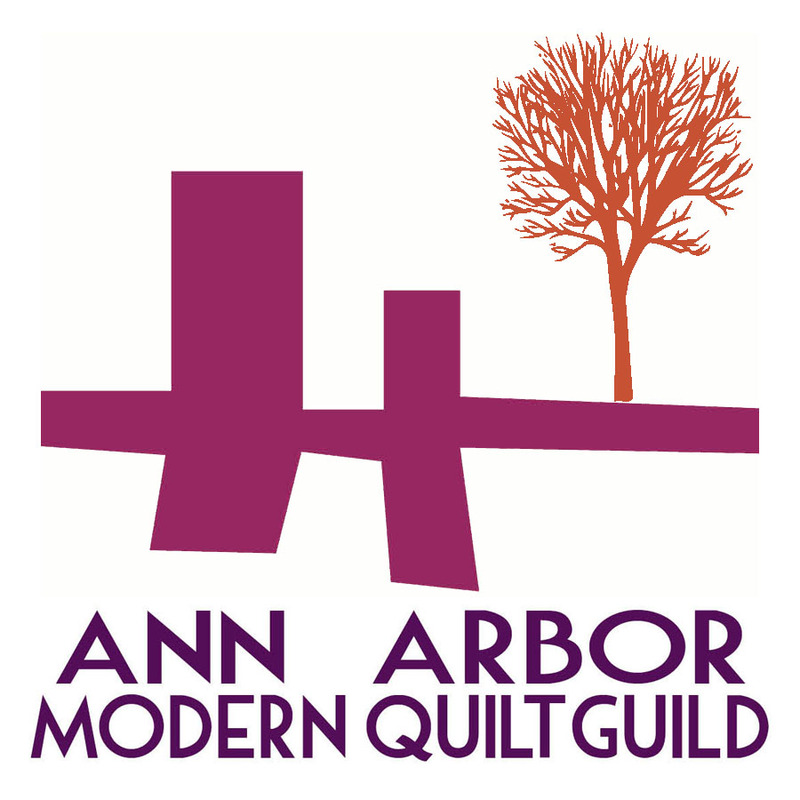 I attended the SE Michigan Crafters Meetup, hosted by Rae of Made-By-Rae last Thursday night. 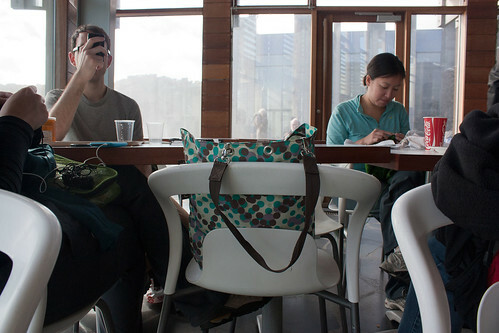 It was so much fun to meet up with other local crafters and work on things with company, rather than in solidtude (I miss my weekly craft nights with Catherine now that she's living in Germany). Every year, around November, I find myself signing up for some sort of holiday ornament/craft swap (2006, 2007, 2009). I always imagine myself having tons of free time to make cute little gifts to swap and it always turns into a time crunch to get everything completed in time. This year, I was determined to have things turn out differently and give myself extra time to prepare. 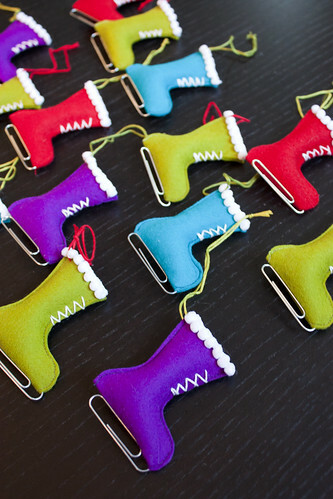 I brought an ornament project with me to work on for the evening and I spent lots of time with my trusty seam ripper because I could not get sew the ornaments perfectly in line with the template. Trust me...there were lots of very oddly shaped skate boot attempts. Fortunately, I finally got into the groove of things, though, by the end of the night. 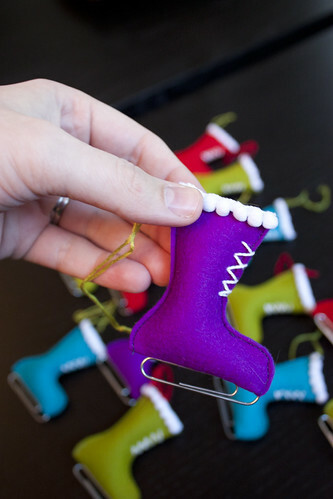 After making a trip to Joann to get Pearl Cotton and pom pom trim, I was able to put the finishing touches on these ornaments (pattern and directions here). These little skates are finished ahead of time (yay!) 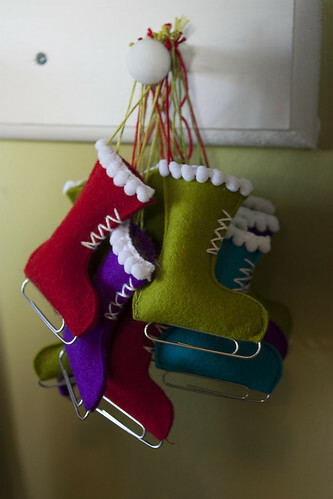 and I'm hoping they reach their destination of the Second Annual Small Fox Ornament Swap safely. I've been knitting like crazy lately (if you couldn't already tell)! 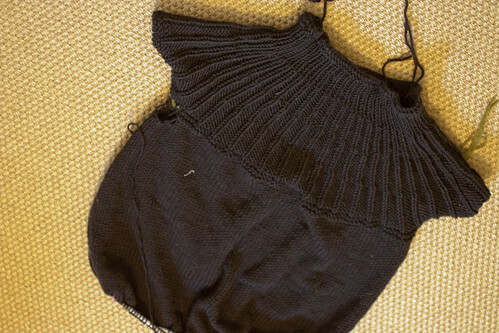 I'm so glad the cool weather has arrived because it's finally the perfect weather for knitting. Here's what I've been making these past few months. If I had to pick one favorite yarn, it would definitely be Berocco Pure Alpaca (used previously for my End of May hat and Zig Zag afghan). My favorite yarn store always has tons of beautiful colors in stock and I came up with this color combination during my last visit (mostly chosen to match my rain coat). 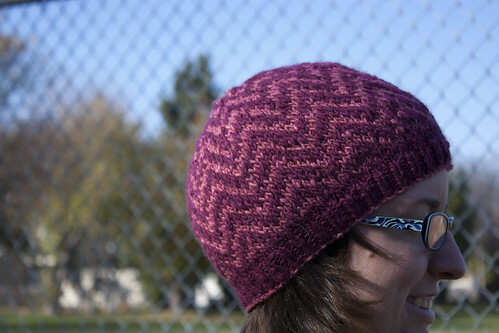 Jon picked out the yarn and pattern for this hat last fall and started knitting the band of this hat. 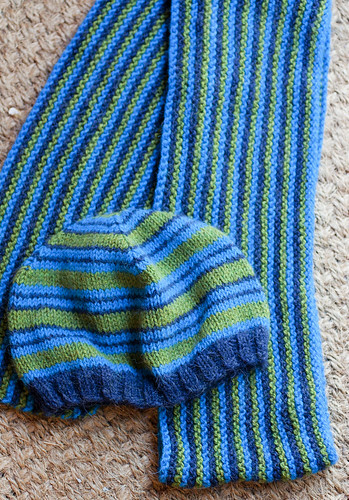 The hat sat around for many months before Jon declared that knitting was no longer for him. I don't really blame him because K2P2 brims are fairly tedious to get started with. 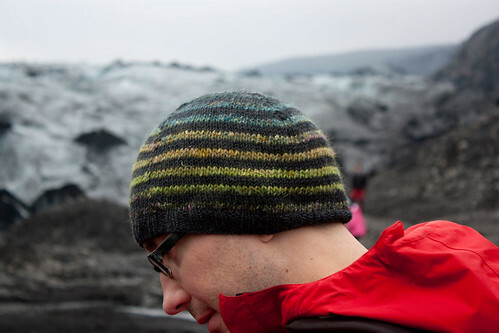 He decided that I should be the sole knitter in our house and asked me to finish this hat for him to wear in Iceland. This is a replacement for the Koolhaas hat I made him a few years ago that is too big and "too nice" to wear hiking. you can sort of see my new scarf peeking through my jacket here. 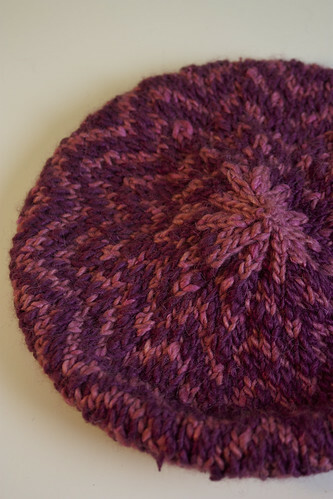 I've been lusting after The Fibre Company Terra yarn after seeing their beautiful ads in Interweave Knits and I finally got around to making a colorwork hat with it a few weeks ago. This is supposed to be an oversized beret, but I didn't do a gauge swatch and used the wrong sized needles so it ended up on the smaller side...now it's just a plain old hat. 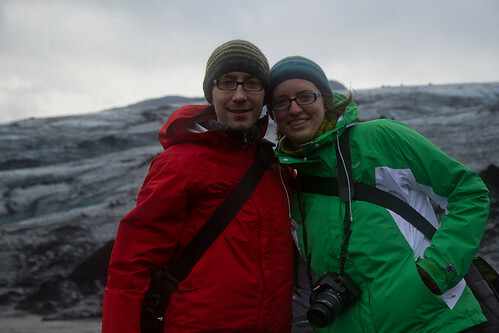 This was my intended to be my official Iceland knitting project. 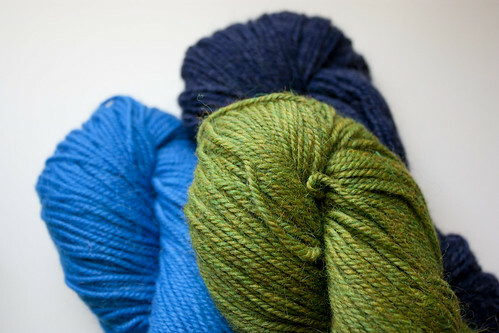 I had lofty dreams of knitting every day in the car, but I was too enamored with the scenery to bother casting on. Because I didn't get started on it until the very end of our trip, it ended up being my airplane/jet lag recovery project instead. 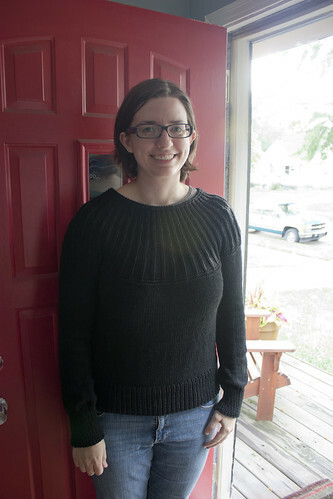 This was such and enjoyable sweater to knit and now I'm totally sold on knitting from the top down. The yarn, Sublime Cashmere Merino Silk Aran, was a dream to use and I was fortunate enough to find a half off sale last winter to acquire it because it's on the pricey side. This sweater is so soft and silky and squishy and I think it will get a lot of use this winter. Jon says that it's the most normal, store bought looking sweater that I've made so far and I agree. I guess I should make sweaters in this style more often.